Note: This post originally appeared on the Marginalia Los Angeles Review of Books blog. We like nothing more than a really big story about religion. If we are religious, it makes us feel good about ourselves regardless of denomination. If we are not, we wait patiently for the other shoe to drop. The media, always ready to sensationalize, is quick to oblige. With some regularity we are promised the next Cairo Geniza or Dead Sea Scrolls before better heads prevail. Recall the Mar Saba letter, the Lost Tomb of Jesus, the Jehoash Tablet, and the James Ossuary, to name only a few recent discoveries. Understanding historical relics or documents, however, is a difficult process, something that experts need time to analyze, contextualize, and assess. Unfortunately, the media doesn’t like waiting. The latest “big” story surprisingly has very little to with Christianity or its older sibling, Judaism. Instead, we have been treated over recent months to a much-needed positive story about its younger sibling, Islam. I refer, of course, to those leaves of an early Quranic manuscript discovered among the Mingana Collection of Middle Eastern manuscripts in the University of Birmingham’s Cadbury Research Library. Believed to date somewhere between 568 and 645, we are told that it is among the oldest Quran manuscripts in our possession. The person who actually wrote it could well have known the Prophet Muhammad. He would have seen him probably, he would maybe have heard him preach. He may have known him personally — and that really is quite a thought to conjure with. This changes the field of Quranic Studies because it provides empirical support for the accuracy of the traditional Islamic accounts that many western scholars have previously claimed to be anachronistic and unreliable, such as the existence of variant manuscripts of the Quran before the collation of the text in 650. If Western scholarship wishes to establish a viable empirical approach to the historicity and meaning of the Quranic text, it must first account for the vast literature on these topics in the classical Islamic tradition. Anything less is academically irresponsible. It turns out, however, that we did not have to wait long for the other shoe to drop. Recent days have seen a spate of media headlines proclaiming not that the Birmingham leaves were a forgery, but that they might actually be so old as to predate Muhammad! The story soon broke that the material quoted in the fragments might not have been written down by someone who listened to Muhammad preach, to invoke Thomas’s words above, but someone much earlier. One does not have to reread Said’s Orientalism to know that there is a long history of Western polemical writing against Islam in the West. Such writings often take the form of accusing Muhammad and the early framers of Islam of plagiarizing from Jewish and Christian sources. They certainly work on the flawed assumption that whereas early Islam was fluid, late antique Judaism and Christianity were both somehow much more stable. But there is an interesting twist in the present story. Most revisionist scholarship has suggested that the Quran was composed sometime after the death of Muhammad. We are now told that maybe, just maybe, it was written before him. Though, since this is played out in the media, evidence is less important than sound bite. I am less interested in the dating of the Quran — I’ll leave that to the technical discussions of those more qualified than I; but what I will point out in the present context is the stakes of the debate. 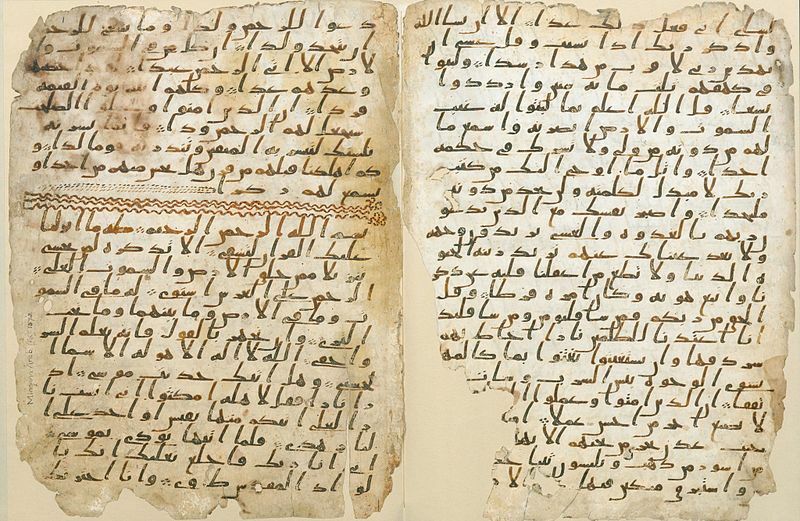 First, we know very little about the origins of the Quran. I think it safe to say that — like the Old and New Testaments — it did not fall from heaven. It was the product of social actors trying to make sense of their world. Second, if we accept the dating of the Birmingham leaves and other early codices that the Quran is an early-to mid-seventh century composition, this does not preclude that we also have to accept the apologetic view of those, like Lumbard, who simply repeat the Muslim account of the Quran’s collection and codification as history and who then want to foist that reading on a misinformed reading public. Third, it should not be a political act to claim that parts of the Quran — given the two points above — might well have predated Muhammad. We do not yet have that evidence, despite what the “experts,” whom the media frequently drags out in front of us, say. Yet I see no reason to think that what became the final version of the Quran — again comparing it to the Old and New Testaments — recycled earlier materials and oral traditions. One has to be able to say this and not be accused of “undermining” Islam. To riff on the old “turtles all the way down” tune, in the absence of any hard and fast evidence, all we have is turtles. All the way down. The media has curiously created a situation that takes the Orientalist notion that Islam is the sum of its monotheistic parts, but in a way rearranges their faces and gives them different names. In so doing, it provides further “proof” for those critical of Islam. The great paradox for me, as I am sure it is for others, is how this new version accepts and uses the religio-Islamic myth of origins to then try to undermine Islam. Allow me to conclude with an aside: I am (relatively) new to the world of Facebook, and, as someone who grew up in Edmonton, Alberta, got all the news I needed from my hometown Edmonton Journal and the national Canadian Broadcasting Corporation (CBC). To my great surprise, the world of Facebook has opened up before me a world of designer news service where everyone can get the fix one needs. Opinions abound, but facts are frequently absent. My rightwing friends post rightwing articles from rightwing news sites that I have never heard of. Ditto for my leftwing friends. Why do I mention this? One can now choose one’s narrative. It would seem that many in the West did not want Muslims to enjoy their five minutes in the spotlight for the full amount of time. The story of the world’s oldest Quran was quickly used against Muslims, as a way to undermine the tradition. But Islam is no more a human affair than any other religion. Aaron W. Hughes holds the Philip S. Bernstein Chair in Jewish Studies at the University of Rochester. Hughes was educated at the University of Alberta, The Hebrew University of Jerusalem, and Oxford University. He received his PhD in Religious Studies from Indiana University in Bloomington in 2000. He has taught at Miami University of Ohio, McMaster University, the Hebrew University of Jerusalem, the University of Calgary, and the University at Buffalo. He is the author of over 50 articles and 11 books. His book titles include Abrahamic Religions: On the Uses and Abuses of History(Oxford, 2012), Muslim Identities (Columbia, 2013), The Study of Judaism: Identity, Authenticity, Scholarship (SUNY, 2013), and Rethinking Jewish Philosophy: Beyond Particularism and Universalism (Oxford, 2014). He is also the Editor-in-chief of Method & Theory in the Study of Religion. This entry was posted in Politics and Religion, Religion and Society, Religion and Theory, Religion in the News, Theory and Method, Uncategorized and tagged Aaron W. Hughes, CBC, Christoph Luxenberg, David Thomas, Edmonton Journal, James Ossuary, Jehoash Tablet, Joseph Lumbard, Keith Small, Lost Tomb of Jesus, Mar Saba letter, Marginalia Los Angeles Review of Books, Mingana Collection, orientalism, University of Birmingham, University of Rochester. Bookmark the permalink.